He’s no stranger to spy noir, and now David Mack is getting into the assassin game. The watercolor artist behind KABUKI, Marvel’s DAREDEVIL, Dark Horse’s FIGHT CLUB, and the credits of CAPTAIN AMERICA: WINTER SOLDIER has painted a cover for the second issue of NICE! Mack’s cover will be offered as a Cover B option in addition to Cover A by interior artist Marc Rene (I, HOLMES). NICE, based on a television pilot script represented by Echo Lake Entertainment, tells the dynamic story of a scarred detective hunting down two inexperienced assassins as they carry out orders for a secret organization. 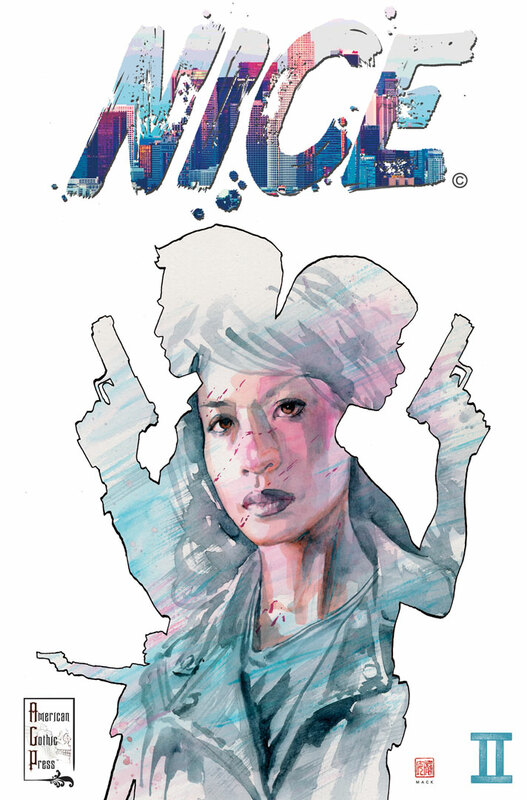 David Mack’s recent work on DC’s spy series COVER with Brian Michael Bendis made him the perfect match for NICE. “I tried to include a sense of the main characters [Grace and Kevin] in the outline shape, and point to a personal story of Detective Hanin as the painting inside,” he says. Mack has also created art for Marvel’s JESSICA JONES, Neil Gaiman’s AMERICAN GODS from Dark Horse, Valiant Entertainment, and Archie Comics. Check out his cover below, and read the full story at the Hollywood Reporter!